On June 11th – The Center for Genomic Gastronomy will be speaking at CKS in Bangalore, India. 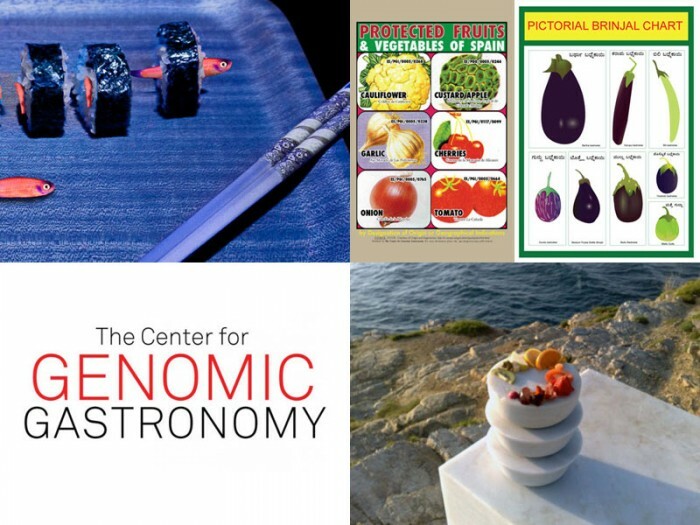 Zack Denfeld from the Center for Genomic Gastronomy will present a few projects that address the challenges facing the intentional design of food systems, making the case that eaters, cooks and taste matter. Glow-In-The-Dark-Sushi, Dairy Farmer Hackers, Brinjal BioDiversity and the Graveyard of Transgenic FoodStuffs will all be covered. The event will last 90 Minutes inclusive of Q&A. Will Eating Vegetarian Bouillabaisse Make Me Sick? In a previous post (Making Vegetarian Bouillabaisse: What Happens to GMOs If They Fail? ), we discovered that the often misrepresented transgenic organism the “Fish/Tomato” did exist and was tested in greenhouse conditions. However, very little information about the different tests that were run using copies of the genome are publicly available. As biohacking (synthbio, artificial life, and good old transgenics) becomes increasingly cheap and accessible outside of expert lab settings, we will want to have a good understanding of how novel genomes with inserted transgenes will affect human and non-human actors. In order to discover what kind of existing knowledge and access an organization like the Center will have in intelligently exploring such scenarios, I attempted to ask a seemingly “stupid” question. as an initial response in the previous post but sought out more expert opinion. In attempting to get an answer I came into contact with three allergy experts, who were each generous with their time and wrote me back. I am grateful because I worry about the current lack of expert advice for the exploding biohacking movement both within and outside the walls of academia. One expert agreed that it is unlikely that the “antifreeze” gene transferred from flounder would cause an allergic reaction if someone ate this tomato since it is typically the muscle proteins of fish that cause the allergic reaction. Another expert seemed nonplussed about the question, but kindly responded. None of the experts I was in contact with knew of any published study of the potential allergenicity of the gene in question. However, going forward with the historical reenactment of science that is the Vegetarian Bouillabaisse project, I want to be sure to ask some of the “stupid” questions that may or may not have been asked in the first go around of the Fish/Tomato. (This post began as comment on this article from the Scientist Gardener blog, and then got really long, so I thought I would publish it here as well). Your post on Dennis Gonsalves’ work and Transgenic Papaya (USDA approval application (.pdf)) is a great introduction to the much more nuanced and complex landscape of opinions regarding the implementation of transgenic agriculture today, as opposed to 10 years ago. It’s a shame you rely on the “Anti-GM activists” as a boogey man. As far as I can tell here in India, the range of stakeholders and the nuance of their positions is not so easy to generalize. I am happy to see you taking into account flavor as one indicator of food system health / resilience as well. I have met increasing numbers of stakeholders, scientists and “activists” in my recent research on Genomic Gastronomy who very much understand the science of transgenic biotechnology, but have well reasoned and legitimate critiques based on the political, ecological and economic implications of SPECIFIC transgenic varieties being released in SPECIFIC bioregions and cultures. In some cases the introduction of a transgenic variety may ameliorate a problem, but in other cases an alternative biotechnology (permaculture, decentralizing farming practices, species substitution) may be a preferred or more efficacious option. Many are skeptical of ANY major food system change (whether Transgenic, Organic, Urban or Export Oriented) that attempts all-at-once, top down changes that don’t take into account the locally existing production, distribution, or consumption practices. (A probably too often cited example: the failure of implementing high-yield varieties of rice in a top-down manner in Bali ) What I like about your post is that you show how the creation and implementation transgenic Papaya at least attempts to take into more considerations than profit / yield maximization, such as the cultural habits of farmers and eaters, particular challenges to a geographically limited space. Working on an island sort of forces one to do just that. But assuming, that this biotech fix will be the right choice everywhere might be jumping the gun. Other than Papaya, I am wondering if any other field tested or commercialized transgenic varieties in the U.S. pay such close attention to how the transgenic fits into and affects a pre-existing food system? I am wondering if you see Mahyco‘s/Monsanto‘s attempted introduction of 6 transgenic varieties of Eggplant (BT Brinjal) in India this year, as a reflection or shadow to Dennis’ practices. Here are a few of the things I understand about both processes and where they differ. (Please let me know if there are errors). Dennis’ work focused on a specific and devastating virus: the Papaya Ringspot Virus. Whatever we may think about the production of Papaya in Hawaii for export to the United States and Japan (a seemingly unsustainable practice that probably won’t survive the emerging changes in energy economies and material flows) one has to acknowledge that there are farmers with livelihood that were directly and immediately effected negatively by creeping papaya ringspot potyvirus (PRSV). It might be possible to co-design a sustainable/resilient food system, slowly, working with farmers to transition Papaya farms towards a collection of other plants that provide Vitamin A & C, and can be consumed locally instead of shipped around the world, and allows them to remain profitable. But that is a slower implementation of a “Social Technology”. Biotechnological often seem easier, and the implied changes in human lifeways and habits are not as explicit as in social or soft technologies. Implementing transgenic Papaya to ward off PRSV is AN option, but may not address any of the root or long term challenges to farming and food security on Hawaii, but it has the advantage of addressing a specific local problem and addressing the problem with the use of already highly specialized species and variety of crop. Papaya could be swapped out with the other transgenic or non transgenic species in the future without disrupting global food security. (Unlike, say, rice, corn, wheat or soy). Although this would require an accompany change in gastronomic practices, especially in places like Japan and Thailand. In contrast, Mohayco/Monsanto’s strain of transgenic Eggplant (BT Brinjal) does not focus on a specific geographic or agrinomic threat. The the transgenic cry gene makes the brinjal plant toxic to lepidopteron insects that attempt to ingest the plant. The lepidopteron is one of the most speciose orders in the world that includes moths and butterflies and agricultural pests such as Shoot Borer (Leucinodes orbonalis) and Fruit Borer (Helicoverpa armigera). When the Bt toxin is ingested by the insect it binds to receptors in the insects midgut and then forms pores, ultimately killing the insect. In addition to the massive order effected by BT (both as a transgene and naturally occurring), India has bred and grows 100s of varieties of Brinjal that each have different agronomic and gastronomic properties. Transgenic varieties of plants with theBacillus thuringiensis (BT) transgene are often marketed basically as a pesticide substitute, because effects whatever Lepidoptera insects attempt to eat the plant. – it directly affects a massive ORDER of species (as opposed to transgenic Papaya which is intended to effect one virus in a GENUS). One design critique I would make is that the transgenic intervention using BT is much too wide. By not attacking a specific and eminent existential threat, a BT variety has a new relationship with many many other organisms in the agricultural ecosystem. Measuring the intended (and possibly, unintended) consequences of the Papaya means starting at the level of genus. – India is home to ~ 1/6th of all the humans that live on the planet. The decision to approve transgenic plants is taken by the GEAC the level of the central national government, although some states have attempted to opt out, but keep in mind that many states of India have more citizens than most European countries! This decision is highly centralized and effects the food security (whether for good or bad) and is quite different in scale than approving a transgenic fruit on a small island. Caution should be prioritized in such a decision. I don’t necessarily think each critique is equally valid: I would like to see independent ethnographic and field test data where available / appropriate. However, they point to the fact that unlike transgenic Papaya which solves a specific and existential threat to a SPECIFIC agricultural variety (Hawiian solo type) the application of BT Brinjal is an probably too large and totalizing a solution for an always-existing agronomic problem (general pest control) for a massive and massively diverse food system. I can’t blame GE skeptics for being more skeptical of the technology and Monsanto as its corporate poster child than before. I should note that the Indian government has its own research initiatives for creating transgenic varieties, which would presumably be distributed under a much more palatable intellectual property and pricing regime if they were ever approved. I will be posting more about that as soon as I track down some specifics. I don’t know much about Hawaii’s Papaya industry, but if it “consists of indigenous and immigrant family farms, hand-tended on small plots of land” and remains that way, that seems politically and ecologically (although not necessarily economically) acceptable. That is in contrast to the consolidation and move towards monocultures that accompanies the the commercialization of transgenic strains. Final thought: Most approved transgenic strains have been grains, Papaya is the exception, and so it may be that as profit-independent University and Government labs create non-grain GE varieties that don’t adversely effect ecosystem services and agricultural biodiversity, or further consolidate farming practices and intellectual property, there will be an increase in popular support for commercializing SOME GE varieties if it is seen to be the most efficacious solution for specific problems. “Our view is that genetic modification is a potentially valuable technology whose advantages and disadvantages need to be considered rigorously on an evidential, inclusive, case-by-case basis: Genetic modification should neither be privileged nor automatically dismissed. On June 17th the Center presented an iBio talk at Bangalore’s NCBS (National Center for Biological Science) about recent research projects that examine Agricultural Biodiversity, Genetic Engineering and Food Security from the perspective of a eaters and cooks. The audience was so big we had to move into a larger auditorium. As luck would have it Daisy Ginsberg and James King (who have both worked on Synthetic Biology) were in town as well, and since we had a captive audience of scientists and post-docs, they gave a talk as well. An incredible 1-2 punch of art, science, consumption and excretion. Thank you to for NCBS for hosting us, and initiating interdisciplinary conversation and post-disciplinary practice. Lecture at NCBS (National Center for Biological Sciences) Bangalore, India from genomic gastronomy on Vimeo.